Abstract reasoning tests are often an integral part of an assessment and by practising you can perform better during the component. It is therefore recommended that you practice abstract reasoning or inductive reasoning practice tests when prepare for aptitude tests, assessments or iq tests. Typically, these tests consists of a logical series of figures where you must choose the next following figure. In the abstract reasoning test example shown below the upper 4 figures are part of the logical series. To solve the question, the next logical step in the sequence has to be chosen from one of the multiple choice answers shown below the sequence. 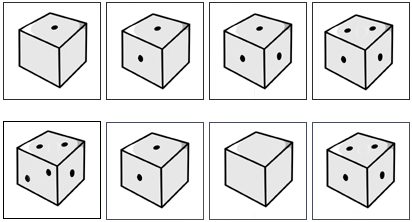 To solve this abstract reasoning sequence you have to notice that every next picture contains an extra dot. The first dot is added to the top square of the cube then to the left square and then the right. The 5th image should therefore have a second dot on the bottom left square. So the correct answer is (A). Practice abstract reasoning by completing the two tests containing 21 figure sequences divided into 2 difficulty levels. To start, choose the easy or hard test shown below. As an alternative to the free tests are the premium abstract reasoning practice tests used by employers with detailed tips and explanations at JobTestPrep.